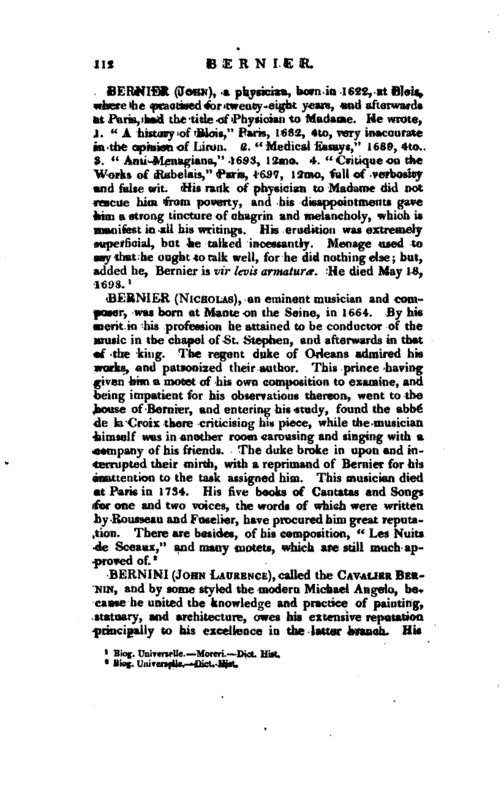 , called the Cavalier Ber­NiN, and by some styled the modern Michael Angelo, because he united the knowledge and practice of painting, statuary, and architecture, owes his extensive reputation prinqipally to his excellence in the latter, branch. His | father Peter Bernini, left Tuscany when young, and went to Rome to study painting and sculpture. Having acquired considerable skill in both, he removed to Naples, and practised with great success. 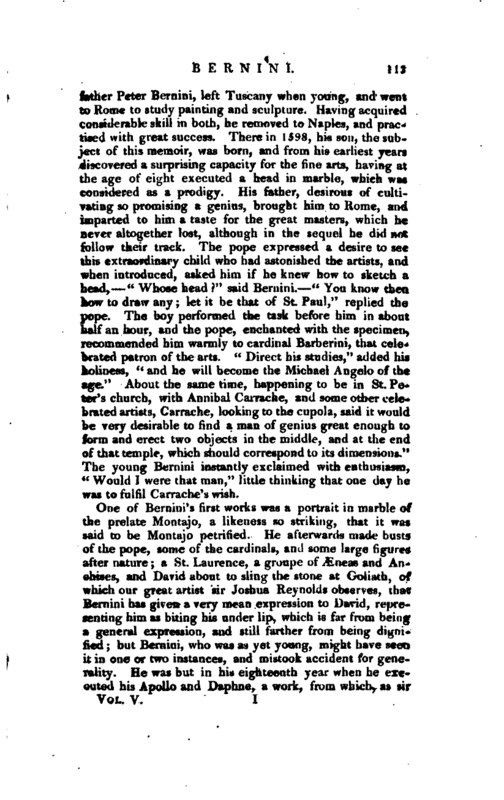 There in, 15.98, his son, the subject of this memoir, was born, and from his earliest years discovered a surprising capacity for the fine arts, having at the age of eight executed a head in marble, which was considered as a prodigy. His father, desirous of cultivating so promising a genius, brought him to Rome, and imparted to him a taste for the great masters, which he never altogether lost, although in the sequel he did not follow their track. The pope expressed a desire to see this extraordinary child who had astonished the artists, and when introduced, asked him if he knew how to sketch a head, “Whose head” said Bernini. “You know then how to draw any let it be that of St. Paul,” replied the pope.‘ The boy performed the task before him in about half an hour, and the pope, enchanted with the specimen, recommended him warmly to cardinal Barberini, that celebrated patron of the arts. 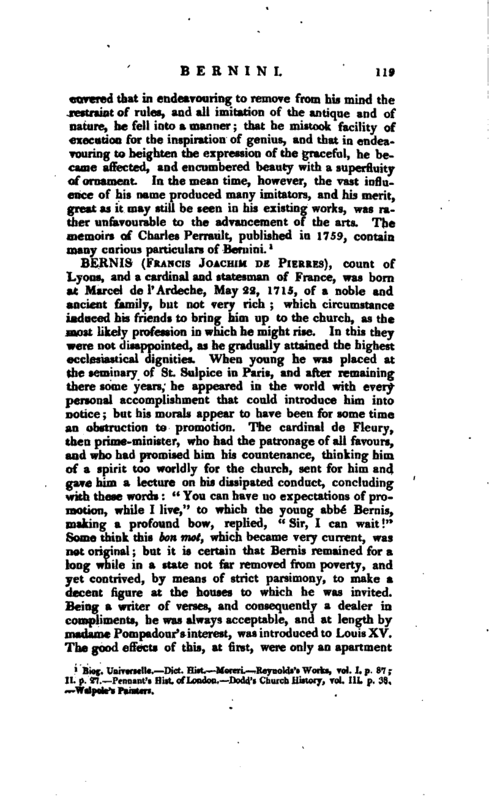 “Direct his studies,” added his holiness, “and he will become the Michael Angelo of the age.” About the same time, happening to be in St. Peter’s church, with Annibal Carrache, and some other celebrated artists, Carrache, looking to the cupola, said it would be very desirable to find a man of genius great enough to form and erect two objects in the middle, and at the end of that temple, which should correspond to its dimensions.“The young Bernini instantly exclaimed with enthusiasm,” Would I were that man," little thinking that one day he was to fulfil Carrache’s wish. One of Bernini’s first works was a portrait in marble of the prelate Montajo, a likeness so striking, that it was said to be Montajo petrified. He afterwards made busts of the pope, some of the cardinals, and some large figures after nature; a St. Laurence, a groupe of ^neas and Anchises, and David about to sling the stone at Goliath, of which our great artist sir Joshua Reynolds observes, that Bernini has given a very mean expression to David, representing him as biting his under lip, which is far from being a general expression, and still farther from being dignified but Bernini, who was as yet young, might have seen it in one or two instances, and mistook accident for generality. He was but in his eighteenth year when he executed his Apollo and Daphne, a work, from which, as sir | Joshua remarks, the world justly expected he would rival the best productions of ancient Greece, but this was not ultimately the case. We are told, however, that when, about the close of his life, he surveyed this groupe, he allowed that since that time he had made very little progress. In truth his style was now more pure, and had less of manner in it than afterwards. His success in the mean time was great, and Gregory XV. who succeeded Paul V. being equally struck with his merit, created him a knight; but it was left for cardinal Barberini, when he came to the pontificate, to complete Bernini’s good fortune. Immediately after that event he said to Bernini, “If you are happy to see me pope, I am more proud yet that you live under my pontificate,” and from that time began to employ him in designs for embellishing Rome, and gave him a pension of three hundred crowns per month. Without altogether quitting statuary, therefore, Bernini now employed his talents on architecture, and recollecting Carrache’s wish, he designed the canopy for the principal altar, called the confessional of St. Peter, supported by four wreathed columns, enriched with figures and ornaments of exquisite taste. When this magnificent work was completed, in about nine years, the pope rewarded him with six thousand crowns, besides increasing his pensions, and extending his liberality to Bernini’s brothers. Another work of his was the fountain of Barcaccia, which has been praised more than it merits, at least it is inferior to that of the Barberini palace. It would be perhaps tedious to enumerate all the productions of Bernini’s genius at this time, but the following are the principal the Barberini palace the campanile of Su Peter the model of the tomb of the countess Matilda, which was executed by his pupils and that of his benefactor pope Urban VIII. When his reputation reached England, Charles I. was desirous of having a bust of himself by an artist of such eminence, and sent him three portraits by Vandyke of different positions. By this means Bernini was enabled to make an excellent likeness, with which the king was so pleased that he took from his finger a diamond ring valued at six thousand crowns, and sent it to Bernini to adorn the hand that could perform such wonders. About the same time an Englishman came to Italy, and had his bust executed by our artist, for which he also paid six thousand crowns. The bust of Charles I. was | originally placed in Greenwich hospital, but is now in Westminster hall, in a circular recess over the stairs, leading to the chancellor’s chamber, between the court of chancery and that of the king’s bench, yet it is doubted whether this be really Bernini’s celebrated bust, or only one taken from it. Vertue was of opinion that the bust now existing was of an earlier date, and that Bernini’s was ’destroyed during the civil war. 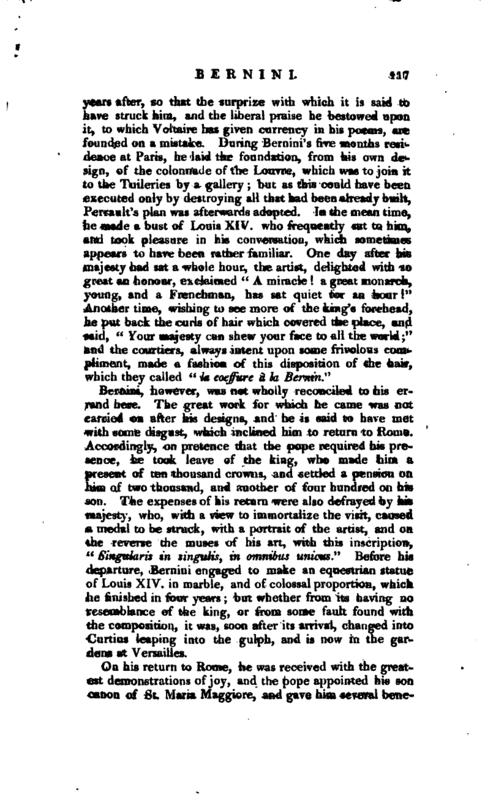 In 1644, cardinal Mazarin, who had known Bernini at Rome, endeavoured, but in vain, to induce him to visit France, and offered him, on the part of Louis XIV. places to the value of 12,000 crowns. Yet he was not happy at home. When Urban VIII. his steady patron, died, and Innocent X. succeeded, envy at his superior talents and high favour with the pontiff, began to appear. The campanile which he had constructed for St. Peter’s, over the portico, which it appeared was not on a secure foundation, threatened to fall, and immediately it was industriously reported that the weight of the campanile would endanger the portico, and perhaps even the dome itself. Although all this was exaggerated, it became necessary to remove the campanile, and the enemies of Bernini triumphed, while the pope, prejudiced against him, deprived him of one part of his labours, and allowed the rest to be suspended. In the mean time he executed for the church of St. Mary the fine groupe of St. Theresa and the angel, one of his most admired works; and became at length a favourite with the pope by a stratagem of his holiness’s nephew. The pope, having an intention of building a new fountain in the piazza. Navona, consulted all the artists of Rome, with the exception of Bernini, whom he affected to forget but his nephew prince Ludovisi having procured a model from our artist, contrived to shew it to the pope, who was so much struck with it, as to receive Bernini into favour, and appoint him to the work, which he executed with his usual taste. 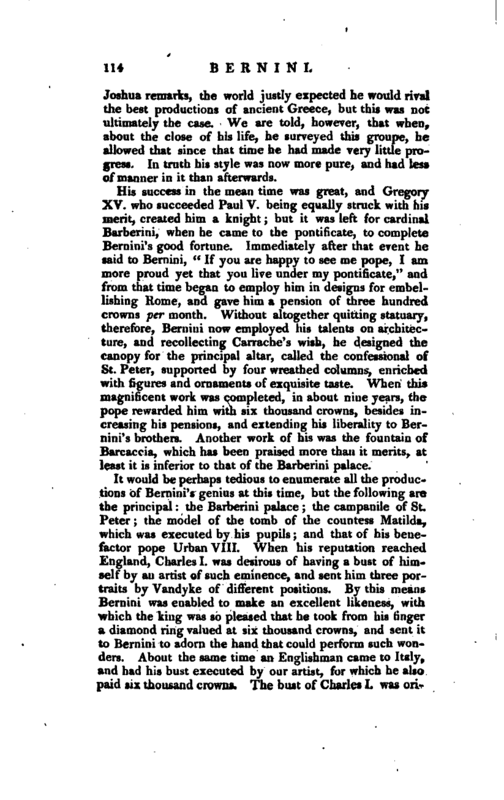 About the same time he built the palace of Monte Citorio. Alexander VII. 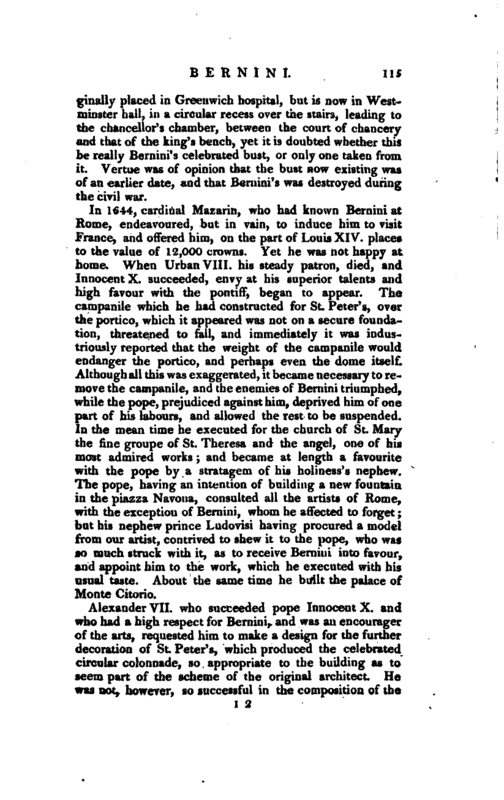 who succeeded pope Innocent X. and who had a high respect for Bernini, and was an encourager of the arts, requested him to make a design for the further decoration of St. Peter’s, which produced the celebrated circular colonnade, so appropriate to the building as to seem part of the scheme of the original architect. Ha was not, however, so successful in the composition of the | pulpit of St. Peter’s, supported by colossal figures representing the four doctors of the church, which, although altered from his first model, has neither the freedom nor spirit of his other works among which may now be enumerated the Odechalchi palace, the rotunda of St. Riccio, and the noviciate of the Jesuits at Monte Cavallo. Although he had refused to come to France, Louis XIV. was still desirous to avail himself of his talents, as well as to pay him a compliment, by consulting him on the restoration of the Louvre. His minister, Colbert, accordingly sent him the plans of that palace, and requested him to put upon paper “some of those admirable thoughts which were so familiar to him.” Bernini immediately made a sketch for the new building, which afforded so much satisfaction to the king, that he wrote to inform him of the very great desire he had to see, and become acquainted, with so illustrious a character, provided this did not interfere with his engagements to the pope, or his personal convenience. Such condescension our artist could no longer resist; and although now in his sixty-eighth year, departed from Rome, in 1665, with one of his sons, two of his pupils, and a numerous suite. No artist ever travelled with so much pomp or pleasure. All the princes through whose dominions he passed loaded him with presents. In France he was received and complimented by the magistrates at the gates of each city, and that even at Lyons, where it was customary to restrict such a compliment to princes of the blood only. As he approached Paris, the king’s maitre d’hotel was sent to meet him, with instructions to do the honours of receiving him and conducting him every where. This gentleman, M. de Chautelon, was so sensible of the importance of his commission, that he wrote a joutnal of all his proceedings while in company with Bernini, a curious work still preserved in manuscript. 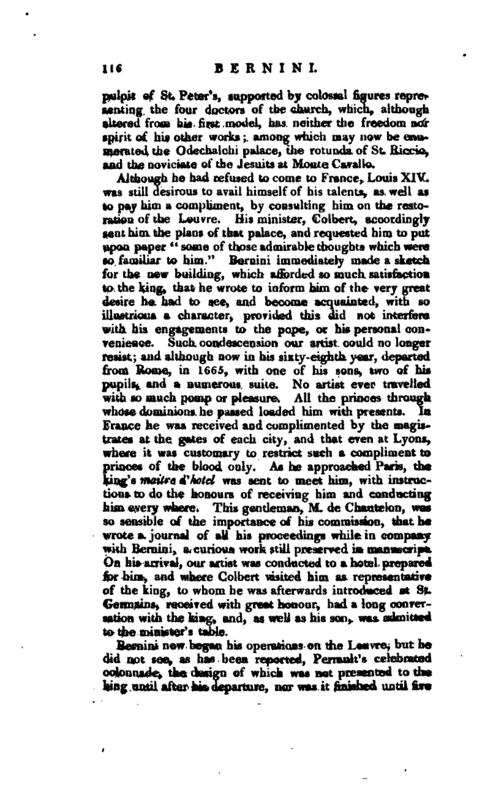 On his arrival, our artist was conducted to a hotel prepared for him, and where Colbert visited him as representative of the king, to whom he was afterwards introduced at St. Germains, received with great honour, had a long conversation with the king, and, as well as his son, was admitted to the minister’s table. Bernini, however, was not wholly reconciled to his errand here. The“great work for which he came was not carried on after his designs, and he is said to have met with some disgust, which inclined him to return to Rome. Accordingly, on pretence that the pope required his presence, he took leave of the king, who made him a present of ten thousand crowns, and settled a pension on him of two thousand, and another of four hundred on his son. The expenses of his return were also defrayed by his majesty, who, with a view to immortalize the visit, caused a medal to be struck, with a portrait of the artist, and on the reverse the muses of his art, with this inscription,” Singularis in singulis, in omnibus unicus." Before his departure, Bernini engaged to make an equestrian statue of Louis XIV. in marble, and of colossal proportion, which he finished in four years but whether from its having no resemblance of the king, or from some fault found with the composition, it was, soon after its arrival, changed into Curtius leaping into the gulph, and is now in the gardens at Versailles. On his return to Rome, he was received with the greatest demonstrations of joy, and the pope appointed his son canon of St. Maria Maggiore, and gave him several | benefices. Cardinal Rospigliosi having become pope by the title of Clement IX. Bernini was admitted into his favour, and employed in several works, particularly the embellishment of the bridge of St. Angelo, and when he had attained his seventieth year, he executed one of his masterpieces, the tomb of Alexander VII. At the age of eighty, he made a beautiful demi-figure in bas-relief, for Christina queen of Sweden, of our Saviour. Being even after this engaged on some architectural works, particularly the repairs of the old palace of the chancery, he applied himself with so much zeal and ardour, as to injure his health. He became restless and weak, and at length totally exhausted, dying Nov. 28, 1680, in the eighty-second year of his age. He was interred in the church of St. Maria Maggiore, with great pomp. By his will, he left to the pope a large painting of our Saviour, executed by himself when he practised that art formerly; and to the queen of Sweden, the piece of sculpture we have just mentioned, which her majesty had refused before, thinking she could not afford to pay for it. He left to his children a statue of Truth, and a fortune of 400,000 Roman crowns. Bernini was of an ordinary person and dark complexion his face indicated genius his look was lively and sprightly, but strongly expressive, when in anger. Although of a fiery temperament, he could not bear the rays of the sun without being incommoded. 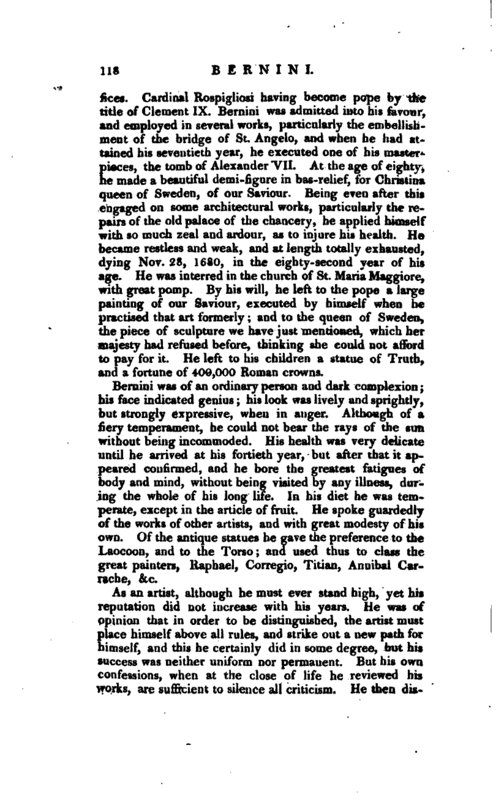 His health was very delicate until he arrived at his fortieth year, but after that it appeared confirmed, and he bore the greatest fatigues of body and mind, without being visited by any illness, during the whole of his long life. In his diet he was temperate, except in the article of fruit. He spoke guardedly of the works of other artists, and with great modesty of his own. Of the antique statues he gave the preference to the Laocoon, and to the Torso and used thus to class the great painters, Raphael, Corregio, Titian, Annibal Carrache, &c.
1 JJiog. Universelle. —Dict. Hist.—Moreri. ^Reynolds’? Works, vol. I. p. 87; II. p. 27. Pennant’s Hist, of London. Dodd’s Chuich History, vol. lit p. 33. Walpole’s Painters.